As a scientist employed by the Canadian government, every question Janet receives from a journalist or member of the public must be screened by a media officer. These officers decide what questions reach her, and have the final say on what answers come back. “They have a list of ‘hot-button’ issues that can’t be mentioned, like climate change, or the oil sands. They say ‘Don’t use that phrase’ or ‘Don’t connect it to industry X,’” said Janet, an Environment Canada researcher who agreed to speak about her experience on the condition we use a pseudonym. She fears she may lose her job for speaking openly about policies that she feels have led to her scientific work being repeatedly censored and misrepresented. 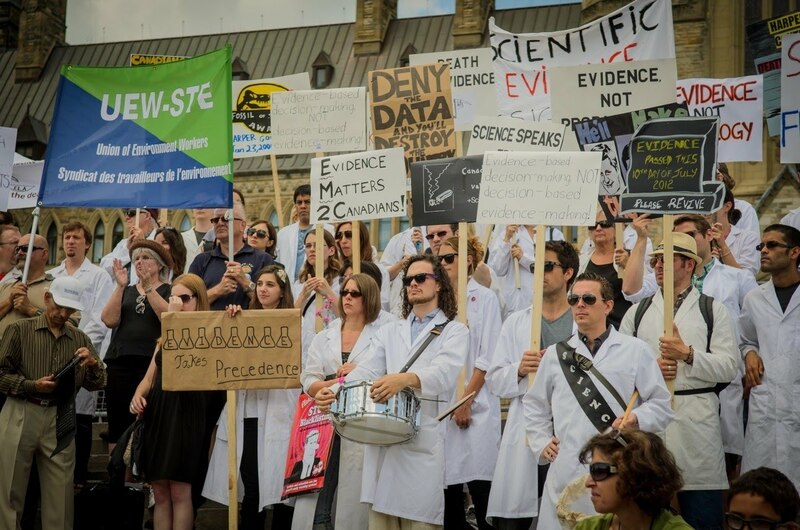 While it is certainly not unusual for government departments to have a media office, the way the Canadian government has systematically used them to restrict the public’s access to researchers and their data has sparked outrage from scientists around the world. The media officers usually request that questions be sent to scientists by email. Phone and in-person interviews are rarely granted, and it’s not always clear to journalists which questions will be answered, or even who is doing the answering. Instead, the media office may remove the original scientist’s name and return answers attributed to an unnamed group. “It really does seem like they hate science"
From the inside, the system is equally faceless. Janet said that correspondence is carried out through a single departmental email address. She said there are clearly multiple people using the account, but they never identify themselves. They just filter and edit and tinker with the information, in total anonymity. Canadian journalists were the first to raise the alarm about the practice, what is now known as “muzzling,” around 2008. It was then they realized that the rules had changed, and media officers were preventing them from talking to scientists they previously had no trouble contacting. Since 2012 there have also been significant cuts to scientific programs, with thousands of jobs lost at government research departments. The cuts are projected to continue, and research centered on the hot buttons—climate, energy, and environment—will be taking the biggest hits. Despite regular media coverage, none of it kind, little about the situation has changed. Like many Canadian scientists, Janet feels that her work is being disrespected and devalued by a government that cares more about message control than the research she was hired to do. “From here, it really does seem like they hate science,” Janet said. This has put Canadian scientists in a very uncomfortable place. They’ve never had a strong voice in government; there is no long-standing science advocacy group, no independent watchdog, no association for their advancement. But with an election set for October 19, scientists and their supporters are determined to push science into the political conversation for the first time. Students, academics, and labour unions have gone from protesting the government, to organizing for change, and they’ve got big plans: policy reports, voter drives, ad-buys, and lobbying—all from a group many bet would never leave the lab. And yet, building a political movement hasn’t come easily to the Canadian science community, and convincing the voting public that science matters as much as ISIS and the economy is still a tough sell. 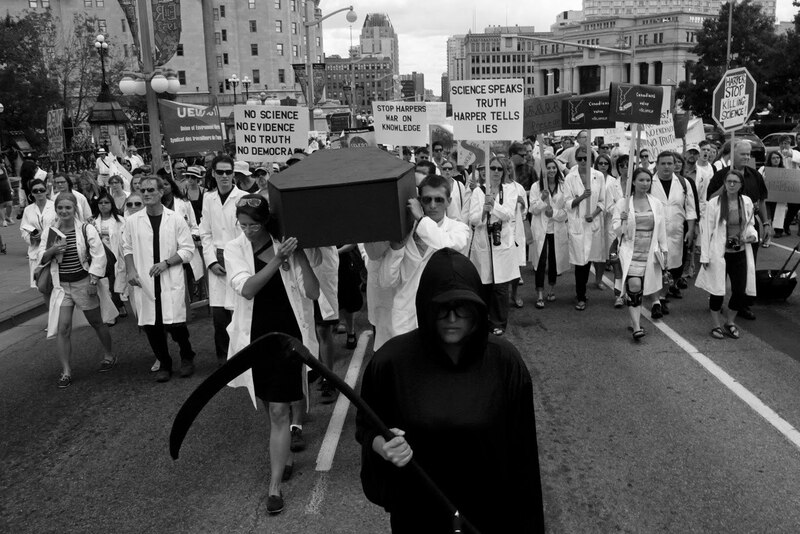 In 2012, a group of scientists at the University of Ottawa began promoting a protest of program closures called “The Death of Evidence.” The scale of the protest was small—their march on Ottawa’s Parliament Hill was planned for the lunch break of an evolutionary biology conference taking place nearby—but the act of protesting the government at all brought a lot more people and a lot more grievances on board. The crowd reached two thousand people according to an estimate by the Royal Canadian Mounted Police, and the lunch-break rally turned into a general protest against the government’s science policies. There was a pleasantly nerd-ish black humour about it: some came dressed as the grim reaper; scientists came in lab coats and acted like there was a funeral; Gibbs gave a mock eulogy to the concept of scientific evidence. The anger, however, was real. And Gibbs and her colleagues, scientists all, realized they had that most prized of experimental results: the unexpected success. The plan was a protest but the result was a movement. Gibbs and the rest of the organizers recognize that without the route they’re building from the lab to Parliament Hill, little about the current situation is likely to change. And they should know. Nearly everyone involved with the group is a current or former university researcher. They have watched for years as their colleagues and collaborators at government departments complained of restrictions and funding cuts with no way to speak out or fight back. In 2013 the Professional Institute of the Public Service of Canada (PIPSC), the union representing most Canadian government scientists, surveyed its members and found that many had experienced political interference in their work. Thirty-seven percent reported that they were prevented from speaking about their work by management or their media office, and 24 percent reported being asked to alter or omit information from a publication or report for non-scientific reasons. Perhaps most shocking, 50 percent said they were aware of cases where they felt health, safety, or environmental sustainability had been compromised by political interference in scientific work. Outside of anonymous surveys though, union members have kept political complaints to themselves. “The fear factor is immense,” said Peter Bleyer, head of policy and communications for the PIPSC. He noted that over 2,000 government scientists—nearly one of every five scientists represented by the union—received “affected notices,” or letters warning that their jobs may be cut in the near future, and were offered no options for re-assignment or training even after union protest. “We definitely have people working for us that would prefer to stay behind the scenes,” Gibbs said. “There is a chill that goes well beyond what the rules appear to be.” Even former government scientists are worried that their severance or pensions may be affected if they protest or speak out. Until recently, many of the scientists I spoke with pointed to a history of good relations between Canadian scientists and the government. Scientists were model employees, rarely taking sick days and often working or consulting long into retirement. In return the government seems to have left them in relative peace to pursue their research. That special relationship appears to have ended around 2008, however—and most blame current Canadian Prime Minister Stephen Harper for the breakup. Harper, a sweater-clad Conservative politician from western Canada, first led his party to victory in 2006. Even though his government had limited legislative power after being elected, governing with a parliamentary minority, it used vaguely defined rules around communication policy to deploy a small army of media officers into government departments. These officers forced scientists and other government employees to clear even the most trivial releases of information through the Prime Minister’s office, control that was allegedly used for political gain. “We discussed every single issue and micromanaged every news release—everything,” a former Prime Minister’s Privy Council member told the Canadian Press in 2010. But despite increased pressure from the media and scientists around the world, government researchers remained restricted by a media policy that looked more and more bizarre as cases piled up. Dr. Marley Waiser, now a retired Environment Canada scientist, said that in 2012 she was blocked from talking to the media about a pair of papers she published about industrial and pharmaceutical contamination in a rural Manitoba creek. “I had heard of scientists being prevented from speaking but no-one here had ever experienced it,” she said. The reason her interview was denied turned out to be worlds away from the government’s big-issue battles on oil pipelines and climate change. She said the media office told her “we don’t want to upset the [nearby] city of Regina”. The city’s sewage plant was implicated in her reports. The whole request had the look of petty local politics, but Dr. Waiser said the order came down from the minister’s office in Ottawa, and she is unsure of how it came to their attention. Dr. Phil Burton’s work was also far outside what he thought the government might consider hot button. Dr. Burton, a professor at the University of Northern British Columbia, had previously spent 20 years with the Canadian Forest Service studying boreal forests in northern Canada. He recalls getting permission from Ottawa to attend a conference, but his permission came with a paradoxical request: “The conference was a series on disturbance dynamics in boreal forests, and the theme that year was climate change. I was told not to talk about climate change or forestry impacts. Well that’s the whole point of the conference!” he said. Janet, my source in Environment Canada, said that there is a “Science Alert” system that researchers are required to fill out before submitting their work to peer-reviewed scientific journals. She said that it asks her to predict the possible policy implications of her results and provide key-words to identify areas of interest. Based on this, her work may be subject to editing by departmentally appointed scientists and nonscientists before she is allowed to send it for peer-review. The system is ostensibly designed to inform managers about the nature of her research, but Janet believes it is also used to control the message of her work in a non-scientific way. Dr. Waiser says she has never had her own work flagged by the system, but confirmed that the emphasis on policy content came in with the Harper government. Most countries that conduct advanced scientific research have a variety of groups that represent science to the government, but Canada has never had this. What Canada does have is a sort of little brother agreement with the United States. Canada’s scientists benefit from an “honorary Americans” tradition that stretches back over a century, and grants Canadians membership in American scientific societies. “I work with government scientists every day [...] and they’ve just had their legs completely cut out from under them"
Because of this, Canadian scientists have had little experience organizing themselves on a national scale, or outside their area of expertise, while American groups like theUnion of Concerned Scientists have been working on science advocacy since 1969. When Barack Obama took office in 2008, for example, he vowed to “return science to its rightful place” and reverse the damage done by the George W. Bush administration, which had been investigated by congress for editing reports on climate change and harassing government scientists to suppress information. The promise was welcome, but not unprompted: science advocacy groups like the UCS had pressed the issue constantly, producing reports on the Bush Administration’s alleged targeting of scientists, lobbying elected officials to support science, and eventually holding the new administration accountable. The same can’t be said here. 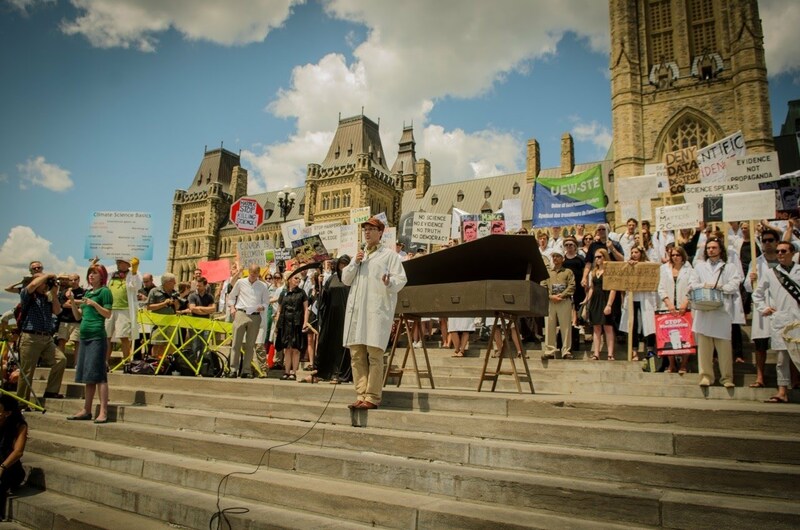 “Scientists are not known for their political savvy,” said Paul Dufour, a fellow and adjunct professor with the Institute for Science, Society and Policy at the University of Ottawa. According to Dufour, scientists in Canada have traditionally been a whine and wimp lobby. “They whine when they don’t have enough money, but they don’t organize themselves politically in any strategic way,” he said. It may be that political meddling with science was what it took to get scientists into politics. At E4D, Gibbs found that while the government has made it impossible for its own scientists to speak up, their situation has prompted many scientists, especially young scientists, to fight on their behalf. And the appeal goes beyond science. Vincent Marquis studied art history, but he sees E4D fighting for freedom of speech and academic independence, the same things he values in his own field. This sort of academic solidarity led him to organize screenings of a documentary on “muzzled” scientists as a volunteer. “Everyone wanted to know more. In that way it was very similar to my own experience, where I came in and I realized how vast and complex these issues are, and how important they are to Canadian public life,” he said. Meanwhile, the PIPSC recently announced that, for the first time in its 95 year history, it too would pursue political action during the election. While they aren’t recruiting any student volunteers, they are prepared to demand political concessions during contract negotiations, and put a real budget behind political action. E4D and the PIPSC have even met to organize strategies for the upcoming election. The start-up comparison is apt: E4D is staffed mainly by smart twenty-something workaholics and relies on the internet and social media to promote their work. They see information as their main currency. Vincent has stayed involved, and is now part of a team that maintains a database of science policy information to help write and place op-eds and press releases through a “networks of experts” sympathetic to the cause. E4D researchers are also working on a comprehensive project to code the scientific value of every bill put before parliament, and how each member of parliament voted—a sort of science report card to measure every politician against. For its part, the PIPSC is relying on more traditional tactics to reach voters at a local level. It’s holding rallies across the country. And it’s planning on buying advertising time during campaign season, and relying on tried and true election-time tactics such as mailings, telephone town halls, and robocalls. E4D has that sway with their volunteers. And they’re using the credibility they earned by organizing young voters and generating media interest to open doors with politicians on Parliament Hill. The newly minted Canadian science lobby—currently consisting of one registered lobbyist, Gibbs—has been taken seriously enough to secure multiple meetings with MPs and the opposition leader’s offices. Gibbs says they are pushing for concrete measures on science to be included in the soon to be revealed election platforms. And their work may be paying off. The Liberal Party of Canada has indicated it’s interested in staking its claim early as the party of science. In May, Liberal MPs introduced a motion to “un-muzzle” Canadian scientists and introduce a parliamentary science officer, and a month later Liberal Leader Justin Trudeau announced that if elected he would review some of the legislative changes to environmental acts under Harper. The Liberal motion was largely symbolic—the Conservative majority sunk it fast—but it was a start, and the campaign promises remain on record. Since then, several MPs from other parties have signed a non-partisan “science pledge” announcing their commitment to scientific integrity. But the official opposition party, the NDP, hasn’t formally committed to any policies—its Leader’s Office says its 2015 election platform is still under development—and E4D hasn’t managed to get a single meeting with a Conservative Party candidate or MP. “It’s unprecedented, to see scientists organized like this"
Gibbs is pleased that the Liberal party is championing their cause. “That’s the first time I’ve ever seen that kind of explicit support for science in an election platform. It’s huge,” she said. Still, she stressed that E4D wasn’t going to back any single party as a result, citing the need to stay non-partisan. And while the government scientists I spoke with don’t have many nice things to say about the party in power—”Let’s face it, this government is at the root of our problems,” Janet told me—they come from a forward-looking profession, and many said that staying neutral was key to their future credibility. So the non-partisan approach will hold, for now. Mostly. The PIPSC insists it won’t be endorsing any candidates but that it will “look at ridings where the results will make a difference,” and would “go into ridings where we think it’s more important that Canadians know the record of this government”. And while getting organized may be unprecedented, there’s nothing new about their demands. They just want to return to the old precedent, set before Prime Minister Harper, when science was largely free of political interference no matter who was in power. Elizabeth May, now the leader of Canada’s Green party, worked as an advisor at Environment Canada in the 1980s under Conservative Prime Minister Brian Mulroney’s government—a time widely regarded as a golden age of Canadian science and environmental policy. Scientists hope all the organizing, campaigning, advertising, and negotiations they’ve been up to in the past year will help get them back to that place. But even if they don’t achieve all their goals, their work to date has been impressive. Political organizations don’t just dissolve after elections, after all, and E4D has managed to get hundreds of young scientists interested in politics. Together with PIPSC and other groups, they have gotten the message out to tens of thousands more people—and they now have the experience and connections to work on Parliament Hill. Whether Harper wins another term or not, his government, which has been disastrous for scientists, may be largely responsible for an unexpected legacy: an influential and independent voice for scientists in Canadian politics at last.